Dashlane has a problem on a site. What can I do? What do the different Impala colors mean? If you are experiencing issues with the autofill on Android or iOS, please refer to the articles Autofill doesn’t work on my Android device and Autofill doesn't work on my iOS device. 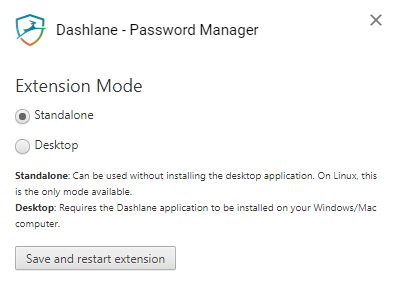 Is the Dashlane extension installed and working? Is the website or webpage disabled in the extension? Are there impalas in the detected fields? Is the correct information stored in Dashlane? 1. Is the Dashlane extension installed and working? The Dashlane browser extension is available on Windows, macOS, Chromebook and Linux. It is officially compatible with Chrome, Firefox, Safari, Edge and Internet Explorer. It can also be installed in some other Chromium-based and Firefox-based browsers such as Opera, despite the fact that they are not officially supported. Below is what an installed and working extension should look like in most browsers. It should be outlined in teal color and not grayed-out except in Safari where it is either dark or light gray. If it isn't outlined in teal, please click here. For Linux and Chromebook, please click here. If it is installed in Firefox (shows in the extension management section of the browser) but does not appear in the toolbar, please click here. Our solution for Linux and Chromebook, an extension that works on its own without having to install our separate desktop application, is also available on Windows and macOS through the extension options. Our extension has two "modes": Desktop for an extension that communicates with a desktop app and Standalone for an extension that works on its own (Standalone is the default and only mode for Edge as well as for Chrome and Firefox on Linux and Chromebook). This mode can be changed by clicking the "Options" button next to Dashlane in the extension management section of your browser. Therefore, if your extension is gray, it may be due to the mode in which it is currently set. Indeed, in Standalone mode, the extension will be gray until you click it and log in to your Dashlane account in your browser. If you would like the extension to connect with the desktop application, please make sure that it's set to the Desktop mode using the "Options" button as explained above. If your extension stays grayed-out even in Desktop mode, please click here. 2. Is the website or webpage disabled in the extension? The Dashlane browser extension allows you to partially or fully disable the analysis of form fields on a specific web page or an entire website. Therefore, we need to make sure that Dashlane was not disabled by mistake on the page where you are trying to have it autofill forms. 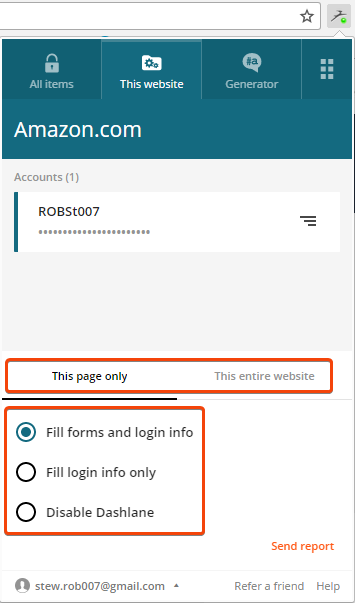 For more information on how to disable or re-enable Dashlane autofill on a specific web page or website, please click here. 3. Are there impalas in the detected fields? After making sure that the Dashlane extension is installed, properly working, and that the form fields analysis is not disabled, we need to verify that Dashlane successfully identified the fields on the page. The first step is checking the presence of impalas (our mascot), teal or gray, in the fields that you're trying to autofill. More information on the different impala colors can be found here. If all the fields have teal impalas but the wrong information is autofilled or if one of the fields is missing an impala, you will need to report the website using the method described in the article How to fix issues with Dashlane on a specific site, and in that case you can likely ignore the rest of this page. 4. Is the correct information stored in Dashlane? If the website on which you are trying to have Dashlane autofill has a URL that looks like www.subdomain.website.com instead of the usual www.website.com, you might need to use our feature for subdomains in order to get it working. For more information on how to manage subdomains in Dashlane, please click here. Indeed, Dashlane usually fills the information to use for autofill from the Passwords section of the app but sometimes the information required to log in to the online account is stored in a different section. Virtual keyboards, mostly used on banking or other financial websites, are actually not supported by Dashlane and cannot be autofilled. 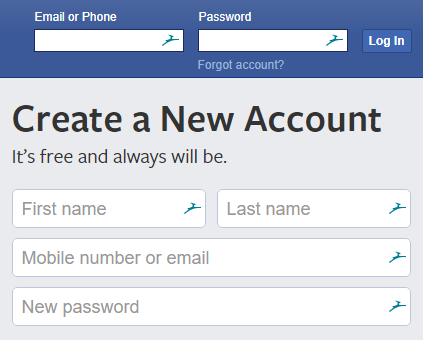 However, most of the time, the virtual keyboard is used for the password but the login field is a regular one that can be autofilled by Dashlane.